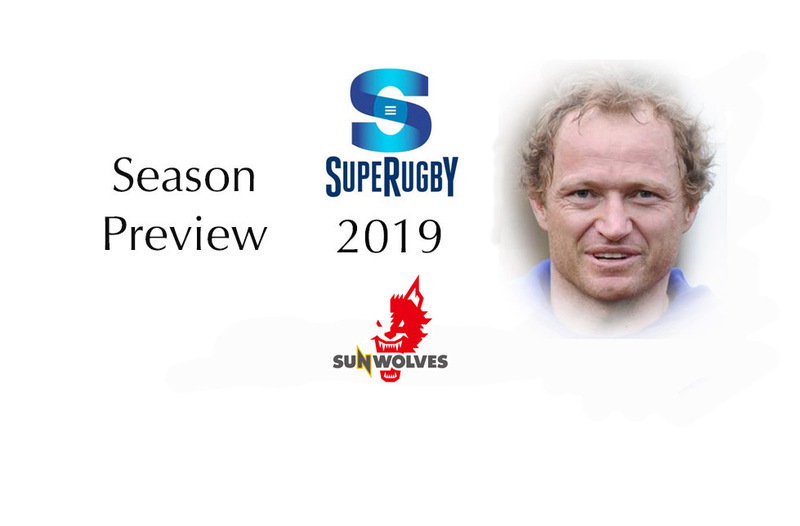 Home Super Rugby Season Preview: The Sunwolves. I am on record for saying that the entire concept of the Sunwolves franchise is a complete waste of time and energy. Their participation in Super Rugby is an artificial construct at best. The team gets very little support from the Japanese rugby establishment, where the corporate owned teams will frequently not release their contracted player-employees to the Sunwolves. The Japanese Top League teams insist that their contracted players’ appearances for the Sunwolves be limited, and that the Top League requirements are always prioritized. Just two examples will suffice to illustrate this problem. In the middle of the 2018 season Lappies Labuschange was withdrawn from the Sunwolves by the Kubota Spears. In 2019 Willie Britz, who has frequently captained the Sunwolves, was withdrawn by his employers NTT Communications Shining Arcs. The corporates that provide the financial muscle that drives Japanese rugby mostly ignore the very existence of the Sunwolves. Financial support and sponsorship is hard to come by. The Sunwolves do not own their own training and playing facilities, having to rely on hired and borrowed facilities for practices and training. They do not have a single home-ground that can be considered their fortress – officially they play out of Tokyo, but also play “home” games in Singapore and Hong Kong. When the inclusion of the Sunwolves in Super Rugby was proposed, SANZAAR stated that they wanted to promote and support the development of rugby in Japan. Super Rugby would provide a development pathway for Japanese players. We were also told that they wanted to gain a foothold in the lucrative Asian market. The facts are in total contradiction to the suggested goals and benefits of including a Japanese franchise in Super Rugby. Firstly, rugby has been played in Japan since 1866. They already have in excess of 125 000 registered rugby players, 3620 rugby clubs, and their national team is ranked 11thin the world. They are hosting the Rugby World Cup in 2019. None of this was brought about or in any way facilitated by the arrival of Super Rugby and the Sunwolves on Japanese shores. As far as being a development pathway for Japanese rugby players, Super Rugby is a dismal failure. In 2019 fully 35 of the contracted Sunwolves squad are not of Japanese origin. Yes, some of them have qualified to play for Japan at international level by complying with World Rugby’s residency requirement, but they are still not Japanese-born locals who have climbed the rungs of the rugby ladder. Only 16 of the players in the squad were actually born in Japan. What is the point in having a team based in Japan if the vast majority of the contracted players are not from Japan?This is not promoting development in Japanese rugby! This is not development pathway for Japanese-born players. Add in the negative impact of a team based in Japan hosting teams from the Southern Hemisphere in a rugby competition. First and foremost, the climatic conditions differ – it is winter in the Southern Hemisphere and summer in the north. Playing in the tropical climates of Singapore and Hong Kong and the heat of a Tokyo summer is a huge challenge for teams that are acclimatised to the southern winter. Secondly, there is the issue of extreme distances and extended travelling. Flying from Cape Town in South Africa to Tokyo, Japan, is a distance of 10 317 km, and a flight of 11 hours and 28 minutes – if you can get a direct flight! Flying from Argentina is worse, 15 229 km and 16 hours and 55 minutes on a direct flight. In each instance the South African or Argentinean teams have to travel across a multitude of time zones in their quest to play a game of rugby in Japan. South African teams cross 7 time zones as they travel east. The Argentinean Jaguares cross 12 time zones if the fly east, and 11 if they can fly west across the Pacific. Distances are a little shorter for the New Zealand and Australian based teams. Even then it can be a grind. Flying from Otago on the New Zealand South Island is a distance of 8 613 km and a minimum of 9 hours 34 minutes in an aircraft. Time zone issues are somewhat less serious for the New Zealanders, who cross just two, and the Australians, who cross one. Of course, the Sunwolves have the same issues in reverse – they are forced to travel south for every single one of their away games, they have no northern neighbours for local derby games. Even flying to Hong Kong or Singapore requires some time zone adjustment. The entire situation is simply ridiculous. And then we turn to the Sunwolves and their on-field exploits. During the three years of their existence, the Sunwolves have played 46 Super Rugby games. They have won just 6 of those games. They have drawn 1, and lost 39. During the three years they have scored 1012 points, and conceded 1962 points, a negative points difference of -950. In just three years! During this period they have scored 122 tries, and conceded a mammoth 283!! Whichever way we try to justify the continued existence of the Sunwolves and their participation in the Super Rugby competition, there is simply no logic or reason for their existence. They bring nothing to the competition, nothing to the game of rugby. They do, however, add enormously to the fatigue and strain and stresses of the primary asset of rugby across the Southern Hemisphere, the players themselves. The entire thing is an exercise in futility. As far as a preview for 2019 is concerned, I hold no hope for the Sunwolves in 2019. At the time of writing, the current squad has not yet been finalised, so not all players who won’t be returning have been listed. We do know that some 22 of last year’s squad will not be available in 2019, including the likes of Willie Britz, Robbie Robinson, Timothy Lafaele, Sam Wykes and a number of Japanese players who have been recalled by their Top League teams. In contrast to the lack of confirmed absentees, the signings made by the Sunwolves have been published. The biggest names Sean McMahon, Pauliasi Manu, Sam Prattley, Mark Abbott, Dan Pryor, Hendrik Tui and Kara Pryor, Jamie Booth, Phil Burleigh and Rene Ranger. When a team of foreign legionnaires gets together and has the opportunity to practice and play together, they will always manage to put together a couple of good performances. Aided by the travelling distances, time zone issues and change in climatic conditions, the Sunwolves will often provide visitors with a stern challenge at home. However, away from home, and living and playing out of a suitcase for extended periods will always suggest that they are on a hiding to nothing. The Sunwolves forwards, bolstered by New Zealand and South African muscle will be more competitive in 2019 than in previous years, but the issue is really one of sustainability. The backs still look like a pick-up team for a Wednesday afternoon friendly. Prediction: If not last in the entire competition, then second last.